Xiaomi Mi A2 : The Chinese smartphone manufacturer Xiaomi has just launched its New-Budget Smartphone in India the Xiaomi Mi A2. The smartphone was announced in July 2018 at an event held in spain and comes with Android One. Mi A2 is the Successor of Mi A1 which was the first Android One smartphone by Xiaomi. The main highlight of the smartphone is Hardware and Camera. 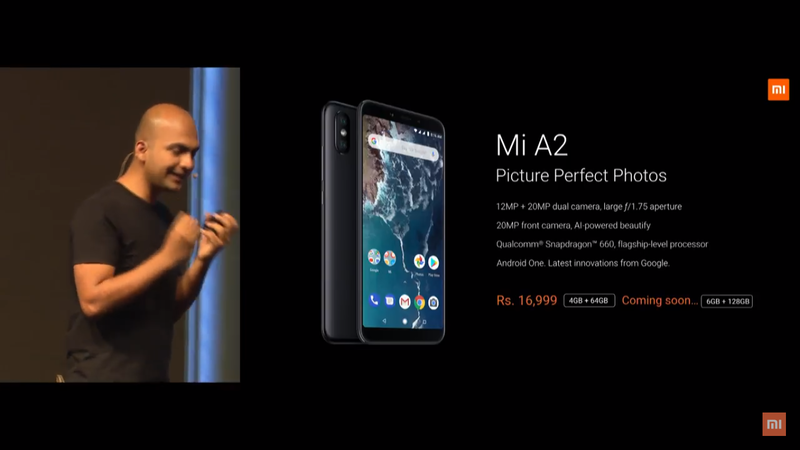 Xiaomi Mi A2 is the Amazon Exclusive product and will be available for Pre-order from Tommorrow onwards i.e 09 August 2018 from amazon.in and Mi.com. The Xiaomi Mi A2 comes in one variant only as of now which offers 4GB RAM and 64GB Internal Storage. While at the launch event company also revealed that 6GB RAM and 128GB Internal storage variant will be available for be launched very soon. There are few launch offers on Mi A2 like Reliance Jio customers will get instant Rs. 2,200 cashback and up to 2TB additional data. Coming to the Performance , processor is one of the main highlight of Mi A2. It is powered by Octa-core Qualcomm Snapdragon 660 Processor clocked at 2.2 GHz. The Smartphone is currently available in 4GB RAM variant but 6GB RAM variant will be launched soon in India. Talking about Camera , it comes with a dual rear camera setup which includes a 12MP + 20MP camera sensor with a f/1.8 + f/1.8 aperture . The smartphone comes with a 20MP front facing camera with f/2.2 aperture for taking selfies. Other Camera Features include gyro EIS stabilization and support for 4K video recording at 30 fps. Battery wise , the Xiaomi Mi A2 is powered by 3000 mAh non-removable battery and it also supports Quick Charge 3 via USB Type C port. Xiaomi has Launched Mi A2 in one variant which comes with 4GB RAM and 64GB Internal storage priced at Rs. 16,999. The smartphone will also come with 6GB RAM and 128GB Internal Storage variant very soon. The Pre-orders of 4GB RAM varaint will starts from 9 Aug 2018 onwards via Amazon.in or Mi.com . Xiaomi Mi A2 will be available with some Launch offers like Reliance Jio customers will get instant Rs. 2,200 cashback and up to 2TB additional data.